One of the pleasant challenges of running an online shop is coming up with a name for your shop or website and for each of your creations. I became a merchant just a month ago and as I began to apply to the task of naming my designs, I was amazed to see so many products named lotus. Not surprising, since lotus instinctively evokes a sense of purity and serenity. In the spiritual traditions originating from India, the lotus is a sacred flower symbolizing creation, divinity, and the purity of soul. Though all deities are depicted as holding a lotus in hand or seated on a lotus, it is most explicitly associated with the Goddess figure. In the Hundred-eight Chant of Goddess Lakshmi (which is actually an invocation for the Goddess), she is referred to as “Padma” (lotus), Padmalaya (residing in lotus), Padmapriya (one who loves lotus), Padmahasta (lotus like hands), Padmakshya (lotus-eyed), Padmasundari (beautiful like lotus), Padmodbhava (emanating from lotus), Padmamukhi (lotus-faced) and finally Padmamaladhara (one who wears a lotus garland). These descriptions also have subtler meanings. The picture above, a painting of the Goddess by a 19th century artist called Raja Ravi Varma, is in many respects a literal rendition of the lotus section of the 108 chants. 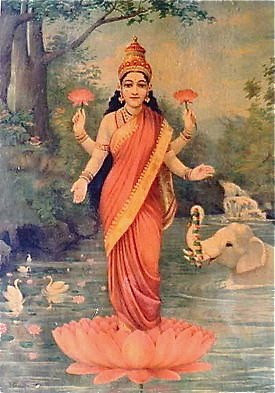 Here the Goddess is shown emerging from a fully blooming lotus above the water, holding lotus flowers in her hands and clad in rose-colored sari . Since Ravi Varma’s time, this painting has become an iconic standard for pictorial representation of the Goddess. In southern part of India it is a common practice to name children after gods and goddesses. However, during my mother’s generation, Padma became an unfashionable name to give to daughters. When I named my daughter Padma, back at home everybody was a little scornful of my choice. My most gratifying moment came during a temple visit when my daughter was four years old. As the priest recited the 108 chants her eyes kept getting bigger with every utterance of her name. She is an adult now and not particularly religious, but, I will say with some certainty that it was then that she became proud of her name. ~ Thanks to Indira Govindan for giving us this lovely blog post. Her shop DharmaKarmaArts can be found on Etsy.